The family of Cal Poly student Jordan Grant have funded two $5,000 journalism scholarships in his honor. Jordan was a first-year Cal Poly computer engineering student who was killed October 7, 2018, in a motorcycle crash on Highway 101. The first recipients are news editor Cassandra Garibay and reporter Aidan McGloin, both on staff at Mustang News. Becky and James Grant, Jordan’s parents, attended an informal scholarship presentation to award Garibay and McGloin on December 7. View footage of the presentation here. The scholarship was named after two local journalists, Lucas Clark, formerly of The Tribune in San Luis Obispo, and Aja Goare of KSBY-TV. Clark and Goare followed the heartbreaking story of Jordan's death, his family's grief and their desire to address safety issues at the intersection of Highway 101 and El Campo Road, where Jordan lost his life. More details here. 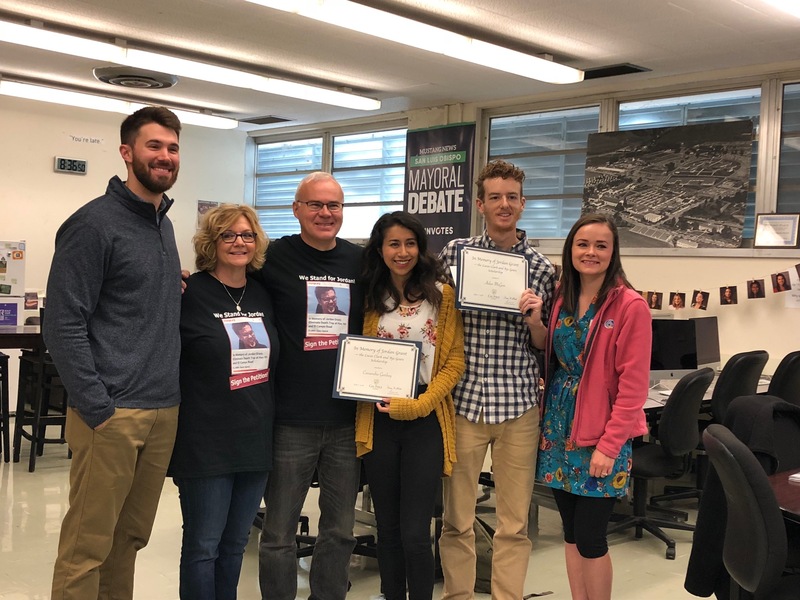 The scholarship is awarded to a journalism student who has sophomore standing or higher, is an active participant in Mustang News, demonstrates excellence and commitment to journalism and demonstrates achievement — both academic and in the field of journalism. The Grants plan to award the scholarship annually on Oct. 7, the anniversary of Jordan’s death. James Grant told The Tribune that he hopes the scholarship expresses their gratitude for Clark’s and Goare’s reporting efforts and encourages more students to dedicate themselves to careers in journalism.